DFI announces a new ECX SBC – ML936-B16C, based on the new options for the low power Intel® Atom™ processor Z530P platform – specifically, the Intel® Atom™ processor Z530P at 1.6GHz and the Intel® US15WP SCH single chip. 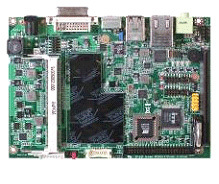 The Embedded Compact Extended (ECX) form-factor is an Intel® open standard with board dimensions of 105 mm x 146 mm (4.14” x 5.75”). Featuring Intel® Hyper-Threading, Intel® Virtualization and Enhanced Intel® SpeedStep® technologies the ML936-B16C is ideal for thermally-constrained fanless embedded applications requiring x86 SBC with configuration flexibility. Intel’s 45nm Hi-k metal gate silicon technology used on this Intel® AtomTM processor and chipset platform reduces power consumption to less-than five watts, while boosting switching speed and transistor density over previous 65nm technology. A single 12 V DC power input on the ML936-B16C SBC simplifies configuration in embedded applications, and further reduces system cost. “The latest Intel® Atom™ processor Z530P at 1.6GHz enables DFI to fulfill our customer’s low power requirements with a stable revision-controlled platform having guaranteed long-term with 7-year long lifecycle support availability.” said Andy Lu, Managing Director of DFI. 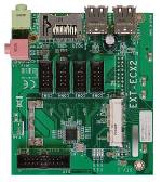 The new DFI ML936-B16C ECX SBC utilizes one 200-pin SODIMM socket supporting up to 2GB DDR2 400/533MHz system memory. There is an integrated Intel® Graphics Media Accelerator (GMA) 500 within the Intel® SCH US15WP and the DFI SBC supports one DVI-I output connector (DVI-D signal only) and an LVDS interface for 18-bit or 24-bit TFT panels. 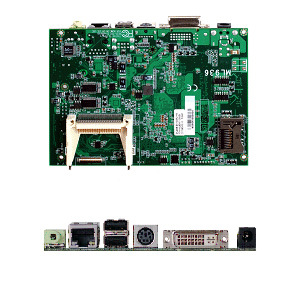 In addition, this motherboard includes a PCI Express Gigabit LAN controller, DC-in 12V jack, four USB 2.0/1.1 ports, two Serial COM ports, CompactFlash socket, one SDIO/MMC socket, and IDE Ultra ATA 33 interface supporting two devices. To provide additional I/O capability, DFI has implemented an expansion daughterboard option for the ML936-B16C. 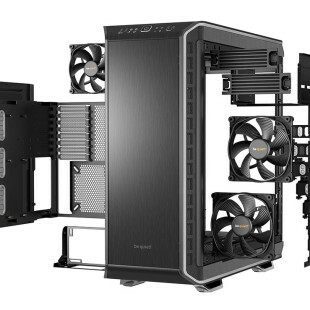 The first expansion daughterboard is EXT-ECX2, providing one mini PCI Express x 1 slot, four USB 2.0 ports, four serial COM ports, one 8-bit Digital I/O connector, one SDIO/MMC socket, and audio interface for line-in and mic-in. In addition, the expansion daughterboard provides a cost-effective means for accommodating customer-specific requirements, including proprietary circuitry. This new DFI product is a low-power embedded solution for applications such as digital signage, ATM/POS terminals, kiosks, industrial automation and control, gaming, medical diagnostics & health care, interactive client, and security.